Our team met in Mendoza on Sunday 13 January. We were two guides and seven clients: Jeff, Mike, Richard and Roland who are all doctors working in different medical fields (knee and hip replacement, anesthetics, emergency room, general practitioner), Jim who works for REI (mountain equipment store in the US) and then our two Alpine Ascents guides Matthew Ehmt, who lives in a cabin in Alaska and Danny Ozment, who lives in his van. We immediately felt in good company! Later our third guide Lhakpa Gelu Sherpa joined us. Lhakpa turned out to be a bit of a rock star on the mountain, famous for his speed record on Everest, but to the team he was most of all a star because of his everlasting good spirits and great cooking skills! A few days earlier, we had met Matthew and Danny for the first time for a review of all our gear including advice on the size of the pee bottle. Who could have known that a 1.25 liter bottle was a good size! Anyways, after a few last minute purchases we were ready and very eager to go. Monday 14 January we all got in the bus and started the 4-hour drive to Penitentes where we had to spend the night before the initial 3-day trek up the Vacas Valley. Unfortunately, the road was blocked by a landslide. What a pain to have to turn back! Luckily, the next morning the road was open again and we could finally start our expedition. Ahead of us we had 1 night in an hotel in Penitentes, 3 days of trekking with light rugsacks and mule support up to Base Camp at Plaza Argentina, then 3 nights in Base Camp, carrying and moving to Camp 1, then 3 nights in Camp 1, carrying and moving to Camp 2 etc, etc. In short, it seemed like we had a full eternity of time in front of us before we could hope to set foot on the summit of Aconcagua! This was a great test of our impatient souls! As it turned out, the days passed by quickly. 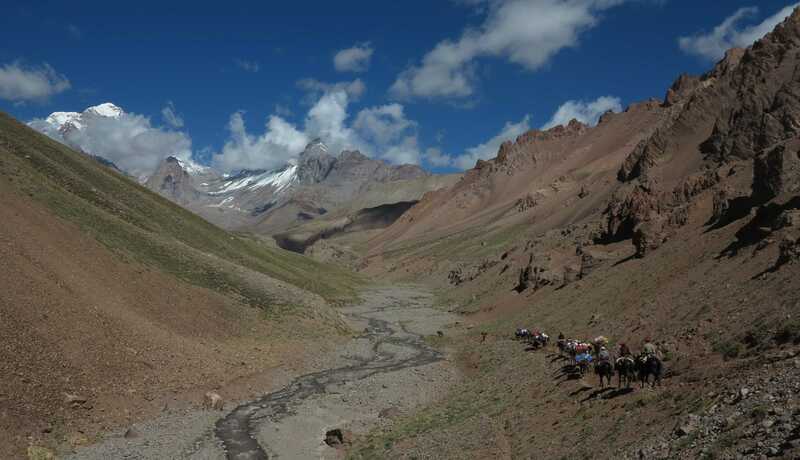 We enjoyed a pleasant 3-day hike up to Base Camp through the beautiful Vacas Valley. The Vacas Valley approach is longer but also much less travelled than the normal route to Aconcagua, which goes through the Horcones Valley. We thoroughly appreciated this as we enjoyed days alone on the trail and peaceful nights in the camps. Every afternoon we would meet the mules with our heavy gear at camp and one night the muleteers made us a delicious asado (barbeque) on open fire with lots of meat, potatoes and corn on the cob. Another night Danny made cheeseburgers for us so food wise we were totally spoiled! We arrived to Base Camp at Plaza Argentina for a resting day and even more food. Gnocchi with tomato sauce and parmesan, pork ribs with stuffed pumpkin and grilled chicken with ravioli. 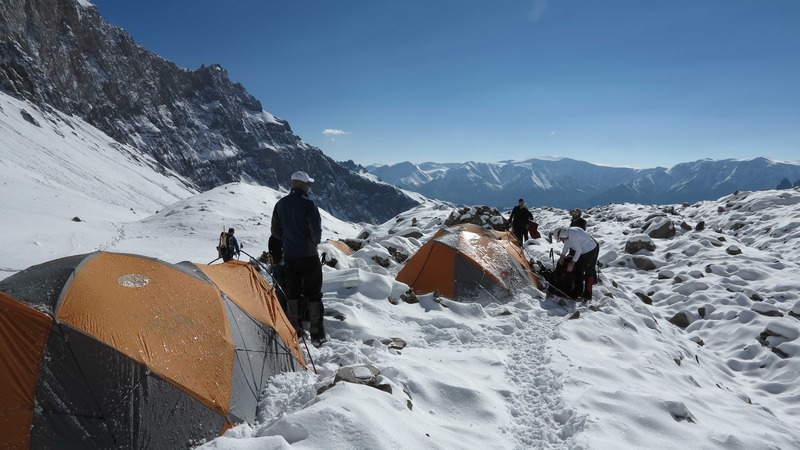 While at Base Camp, we carried a lot of our heavy equipment up to Camp 1 and came down to sleep again to Base Camp. It had started snowing in the afternoons and on the third day it snowed quite a lot as we moved camp from Base Camp to Camp 1. In Camp 1 we spent again 3 nights, carrying equipment to Camp 2 one day, then resting one day and finally moving to Camp 2. By now we were getting used to life on the mountain, not thinking to the summit (at least trying not to think too much to the summit), just trying to preserve our energies, eat, drink and acclimatize most efficiently while enjoying the good company of our team mates. Danny cooked empanadas, Matthew made quesadillas and french toasts (now also known as freedom toasts) and despite all the recent snow showers we enjoyed a warm and sunny resting day with beautiful weather and fantastic views. Alpine Ascents was our chosen guide company for the Aconcagua expedition. They use four camps on the mountain instead of the usual three, which means that they have different camps than almost everybody else. In Camp 1 and 2 we were completely alone, enjoying the serenity of the mountain. That is, in Camp 2 we did not enjoy so much. 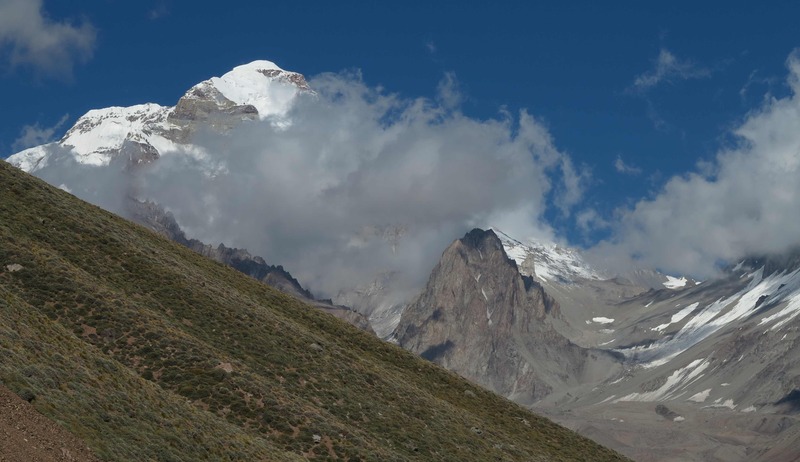 The camp is located in Ameghino Col, quite a windy place between the Aconcagua and the Ameghino peaks. 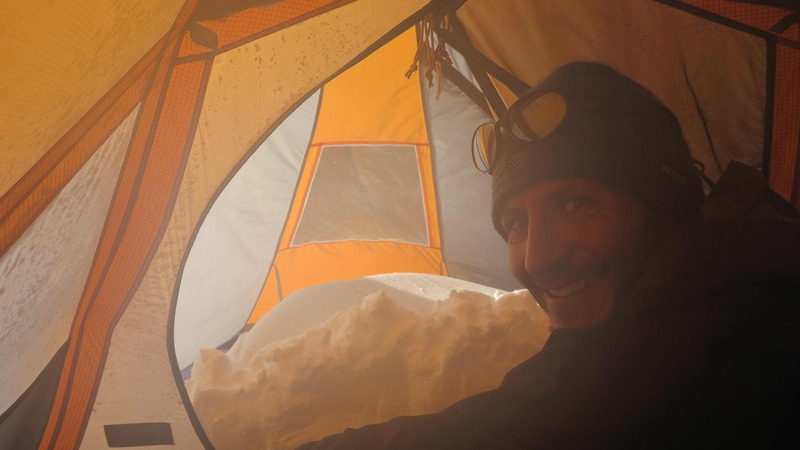 It started snowing again as we set up the tents and that night we did not sleep much as the wind was howling and blowing the loose new snow under the fly and into the vestibule of the tent where it formed a great big snow drift. This was our first “normal” night on Aconcagua after enjoying the mild temperatures at Base Camp and the very snug and protected location of Camp 1. 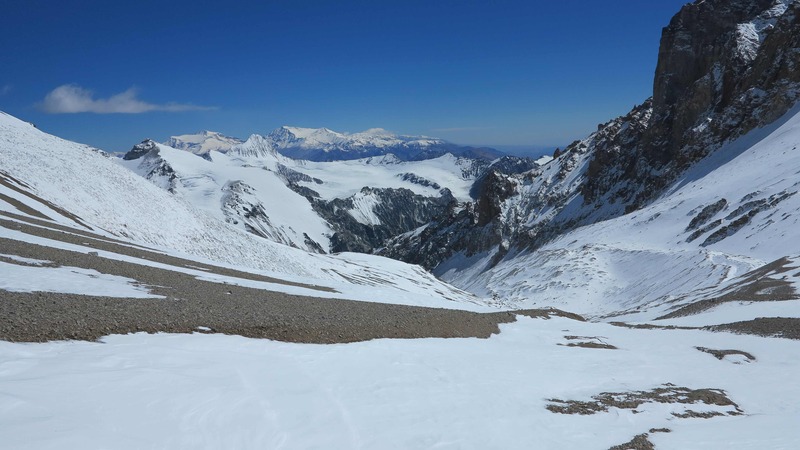 By now a lot of snow had fallen on Aconcagua in just a few days and our guides had to make an important decision. Our planned route, the Polish Variation Route, goes up close to the foot of the Polish Glacier where it traverses across the mountain to a high camp at Black Rocks at almost 6300 m. With all the new snow however, this route was becoming too risky with danger of avalanches so Matthew, Danny and Lhakpa decided to change the route and take the lower traverse across to Camp Guanacos at 5500 m and then establish high camp at Camp Colera at 6000 m. This would make our summit day longer but it was the safer option. So after just one night at Camp 2 in Ameghino Col, we moved to the more protected and less windy Camp Guanacos. 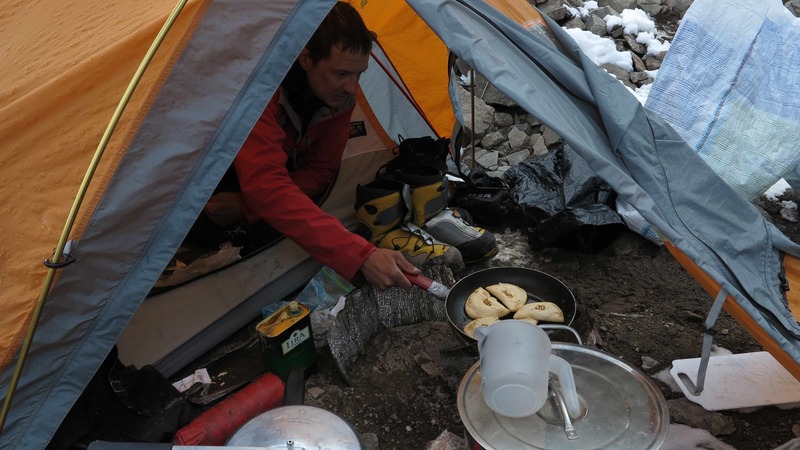 We spent 3 nights there, we back-carried some stuff from Ameghino Col to Guanacos and we enjoyed a resting day with some sun, some snow showers and quesadillas for lunch while we prepared to move to high camp the next day. The weather forecast for the next day was not brilliant but the day after again looked like it could be a good day to summit with little wind and no snow showers. 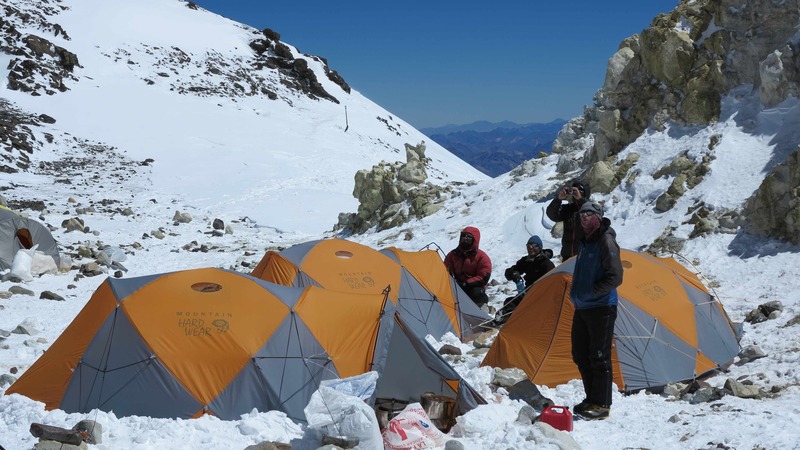 In Camp 2 we did not sleep much for the wind and in Camp Guanacos and Camp Colera at 5500 m and 6000 m altitude respectively, the thin air made it difficult to get a good nights sleep. But we needed the time to acclimatize to the altitude. We saw several groups passing us on the way up and we saw quite a few of them coming back down again because one or several team members were not feeling well. Apart from moving up too quickly, these guys did exactly the right thing. They came back down together as a team. 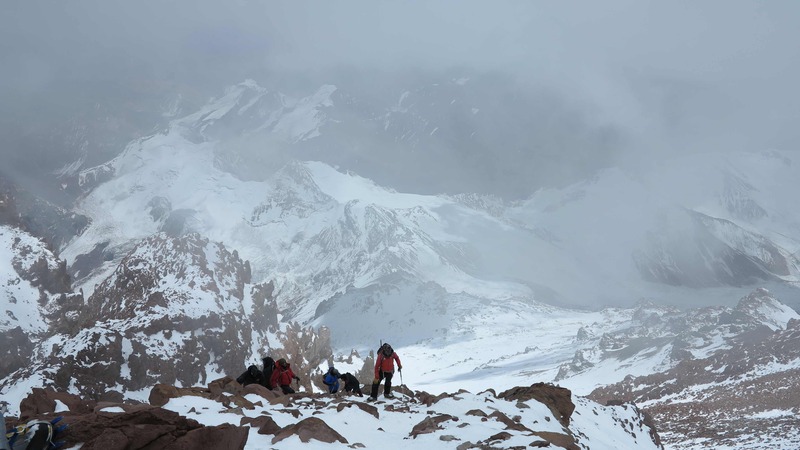 This season, already 5 people died on Aconcagua, which gives you something to think about as you prepare to summit. Nothing is more important than returning back down safely. No summit is more important than your life. And your team is your life insurance up there. On the morning of 29 January we woke up at 4 am and started preparing ourselves for a summit attempt. “Waking up” is maybe an exaggeration. Nobody got much sleep that night. We were at 6000 m, the air was thin and we were all struggling with breathing at night. Apart from that, the wind had picked up during the night and now it was seriously windy with gusts up to 100 km/hour. We were having trouble hearing what Matthew was shouting in the neighboring tent. Were we going or not? Yes, we are going! Dammit, it was bloody cold even inside the tent, the inner walls were completely covered in ice, which showered down on us every time the wind shook the tent, but we got ourselves ready and Marco went to the guide’s tent to pick up hot water for tea. He came back with the message that the wind was a bit too strong to make it the ideal summit day. Stand by and be ready to leave with short notice if the wind drops! We waited in the sleeping bags with all our clothes on until 7.30. By then it was definitely too late to go and we dozed off until the sun came out and warmed up the frozen world a bit. At around noon the wind died down and we enjoyed the afternoon outside the tents. Three Italians came down the mountain. We all waited to hear news but unfortunately the guys, who were strong alpinists, did not reach the summit. They had to turn back for the persistent ice-cold wind. Now we could only wait and hope for better luck the next day. The weather forecast was obviously unreliable so we just set our alarms for 4 am again and hoped for the best. During another night of very little sleep we listened anxiously to the wind, which gradually quieted down and left us with the beginning of a brilliant summit day. It was still dark when we got out of the tents under a sky full of stars and dressed in absolutely all our clothes: Two pairs of socks and double boots (Spantik), 2 pairs of long underwear, soft shell pants, hard shell pants, down pants (puffy pants), 2 pairs of long sleeved tops, thin windbreaker, soft shell jacket, hard shell jacket, big parka, liner gloves, big mittens and windbreaker cover mittens, neck gaiter, buff and of course a good woolen hat. At 5.30 we started walking slowly, slowly up the slope of Aconcagua in the light of our head lamps. How to describe the summit day? It was physically hard, yes. But this was why we had trained for 4 months so we were not unprepared. It was cold, yes. It was even colder than we had imagined! The feet and the fingers were freezing despite all our top quality equipment. But we were not going into hypothermia so ok, we could handle the cold. No, the hardest thing about the summit day was the “waterfall” of thoughts, of psychological fears created by our not very well oxygenated brains. We were listening to any small message from our bodies and taking it as an imminent sign that we would fail to reach the top! The battle with our brains continued all the way to the summit with no rest because the last meters were also the absolute hardest. 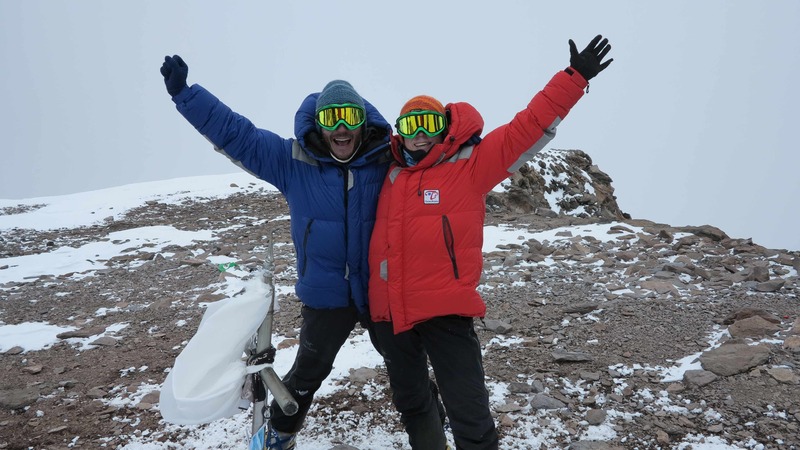 But finally, after 4 months of determined stomach exercises, after 14 days in a tent moving incredibly slowly up the mountain and after 9 long hours of mental masturbation we could breathe the thin air of the summit spirits of Aconcagua!